IKEA’s Kallax series—the Swedish retailer’s answer to the discontinued Expedit shelving system—has long been a mainstay in our homes, especially when it comes to storage. The versatile line offers a slew of customizable shelves that can fit right in with a variety of decorative styles and aesthetics. Tack on the fact that the simplicity of their structure allows them to be easily customized, and you have a real winner. 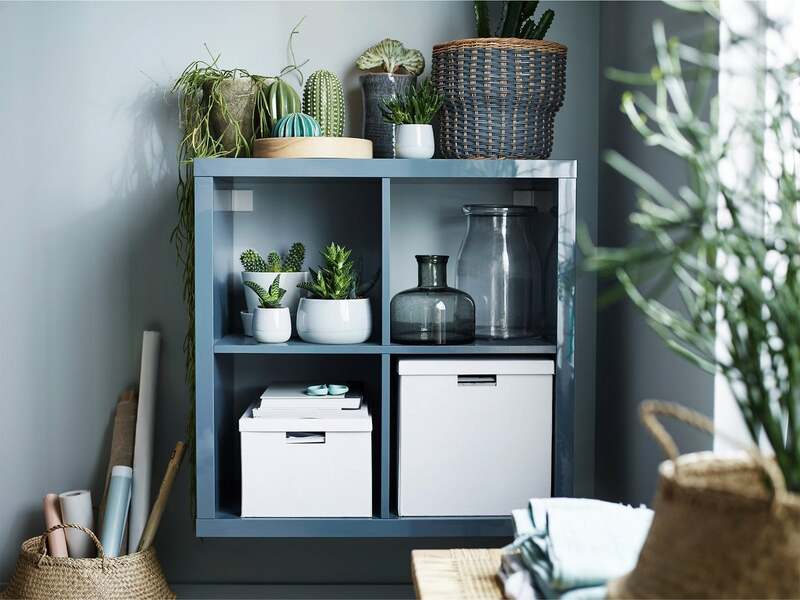 Both a decorative and functional staple for just about any room of a home, the streamlined features of the Kallax shelves have made them one of the more sought-after pieces from IKEA. With this in mind, we turned to a few of our favorite DIY-ers who made their Kallax their own. Ahead, a few ingeniously crafty ways to personalize this not-so-standard shelving unit—read on for the best IKEA Kallax shelves hacks we’ve seen so far. This hack, we spotted over on The Decorista, transforms the Kallax unit into a style-focused storage solution with the help of a vibrant splash of paint. Paint your unit in the same shade as the walls and allow it to become a seamless extension of the walls. Place the Kallax unit on its side and pair it with a custom-fit foam cushion to create the ultimate storage bench for the entry. Get the full scoop on this setup on Tonic Living. For a more dynamic rendition of the side-setup hack, take a style cue from this situation—we came across on Redbook—where a set of metal-detailed peg legs give an added dose of height and personality to the otherwise streamlined shelf. We can’t resist a solid pop of color, especially when it comes in an unexpected form. Here, a statement-worthy shade of yellow imparts the streamlined shelf with a welcome burst of color, allowing it to fit right in with its equally bold and bright surroundings. Get the how-to on Damask Love. According to the duo who lives in this San Francisco home, the best way to make the most of tall ceilings is to fill the space with a spanning floor-to-ceiling shelving unit. The relatively budget-friendly IKEA hack is comprised of three Kallax shelves placed on top of one another—they’re bolted to the floors and ceiling for added support—and finished in a glossy and statement-worthy shade of navy. This one is about as simple as they come: simply set a pair of the Kallax units side by side to transform the set into a handy storage system or even a media center. Swap out the pulls on the cabinets with a fresh set or sub in new baskets to create a personalized piece. See more on Lisanne van de Klift. Here’s the bar cart you never knew you wanted. All it takes is the addition of a new set of glam legs and a handful of decorative accents to transform this shelf into the ultimate entertaining center. Get the how-to on The Everygirl plus, see the two other ways the piece can be styled! Can you spot the hack? This DIY is all about a cleverly concealed storage solution, which comes by way of a two-tone coverlet. The skirted table (which actually happens to be an Expedit bookshelf) houses a slew of essentials—from books to files—keeping them neat and out of sight. Get the how-to on Nicole Gibbons Style. The best way to upgrade a standard storage piece? A mod base will certainly do the trick. Here, a standard shelf is reinvented by way of a mid-century-modern-inspired addition, which manages to elevate the unit both physically and aesthetically. Get the how-to on Hawthorne and Main. Who knew that a glam storage unit was just a DIY away? We’re swooning over the thoughtful details that comprise this elegantly-crafted piece—not to mention the ornate mirror on top to match. Gold ring knobs and a fun overlay detail instantly transform the bulky unit into a stylish statement. Get the how-to on The Pink Dream.